Ludwig and Malwine Schnorr von Carolsfeld as Tristan and Isolde in the 1965 world premiere of Wagner’s Tristan und Isolde. Isolde dies at the end of the opera. Read through the list of the most-performed operas in the world and you start to see some disturbing trends. Most of the parts are men’s roles; if you’re the lead protagonist and female in a popular opera, your chances of dying before the opera’s end are extremely high. This creates an imbalance of roles and an imbalance of representation that both trivializes and stereotypes women on stage – and, by its persistence, locks the types of stories being told. A poster for Tosca. The leading lady (and the only female character in the opera) dies at the end. La Traviata. 10 principals, only 2 of whom are women. The female protagonist dies. Most-performed opera of 2014-2015. Carmen. 12 principals, only 4 of whom are women. The female protagonist dies. Tosca. 9 principals, only 1 of whom is a woman (although the boy’s part is often sung by a woman). The female protagonist dies. La Bohème. 10 principals, only 2 of whom are women. The female protagonist dies. Individually, these operas are not problematic; as representatives of the general repertoire, they promote casting and narrative tropes that are not models of diversity or representation. Really Spicy Opera will seek to address this through a three-year Women in Opera initiative. Be created by a musical and literary writing team that is at least 50% female/female-identified. Feature a minimum of 60% substantive women’s roles. These must be important characters – maids with a line or two don’t count. Do not have maids, nuns, courtesans, prostitutes, or escorts for characters. Have the lead female protagonist(s) still be alive at the end of the opera. Pass the Mako Mori Test. 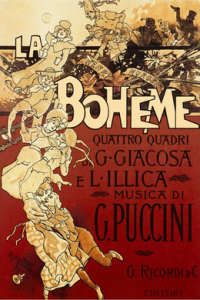 A poster for La Bohème. Of the two female characters, one has fidelity issues and the other dies. Q: How do I know if my work passes the Bechdel Test? Ask yourself: Does it have (a) at least two named women who (b) talk to each other (c) about something besides a man for at least 60 seconds? If the answer is “no” to any of the above, it doesn’t. For practical purposes, we’ll exclude arias/aria-like sections from the calculation. Any sort of recitative/dialogue needs to pass this test. Q: How do I know if my work passes the Mako Mori Test? Ask yourself: Does it (a) have at least one female character (b) who gets her own narrative arc (c) that is not supporting a man’s story? Q: Why aren’t you addressing _______ gap in opera? Addressing systemic inequities requires a systemic response. We are doing our part by selecting one specific issue in opera and addressing it through focused action. Q: Can I send you an opera libretto? Only if it’s part of a submission that also includes the score. Librettos are very handy to have, but we’re not in the business of pairing librettists with composers at the moment. Q: So how do I send you an opera score? Send an email to spicyopera@gmail.com with the subject Women in Opera Initiative with your score attached as a PDF. Please also fill out this application form. If we get one but not the other, we won’t consider your application. Nor will we hound you to send in the other part – that’s your job, not ours. Q: But what if my score is gigantic? If it’s larger than 15 MB, we recommend sending a link to Dropbox or a similar file-sharing site instead of a file attachment – just like any other time you’re sending large files around. Also, if you created the score using Finale, Sibelius, or some similar program, what on earth are you doing that your file is that large?